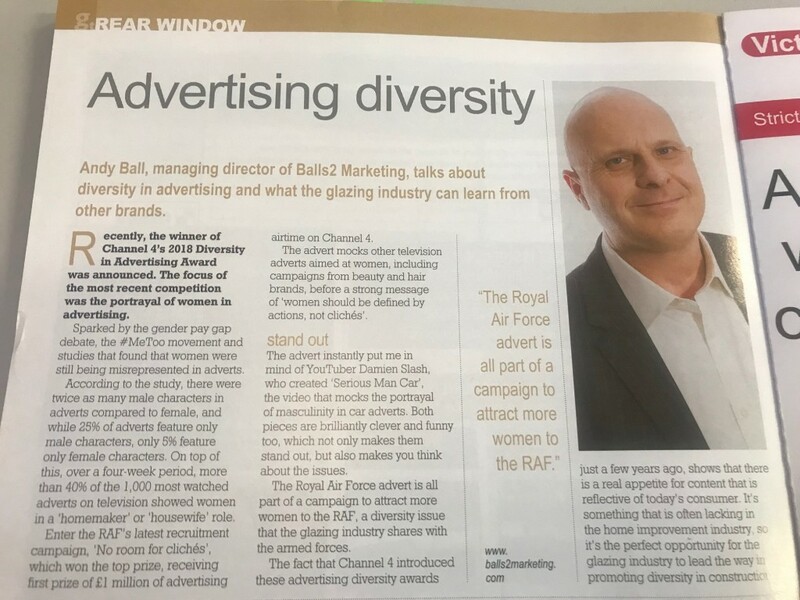 Andy Ball, Managing Director at Balls2 Marketing, the PR & marketing agency for the glazing industry talks about diversity in advertising and what the glazing industry can learn from other brands. Recently, the winner of Channel 4’s 2018 Diversity in Advertising Award was announced. The focus of the most recent competition was the portrayal of women in advertising. Sparked by the gender pay gap debate, the #MeToo movement and studies that found that women were still being misrepresented in adverts. According to the study, there were twice as many male characters in adverts compared to female and whilst 25 percent of adverts feature only male characters, only five percent feature only female characters. On top of this, over a four-week period, more than 40 percent of the 1,000 most watched adverts on television, showed women in a ‘homemaker’ or ‘housewife’ role. Enter the RAF’s latest recruitment campaign, ‘No room for clichés’ which won the top prize, receiving first prize of £1 million of advertising airtime on Channel 4. The advert mocks other television adverts aimed at women, including campaigns from beauty and hair brands, before a strong message of ‘women should be defined by actions, not clichés’. The advert instantly put me in mind of YouTuber Damien Slash, who created ‘Serious Man Car’, the video that mocks the portrayal of masculinity in car adverts. Both pieces are brilliantly clever and funny too, which not only makes them stand out, but also makes you think about the issues. The Royal Air Force advert is all part of a campaign to attract more women to the RAF, a diversity issue that the glazing industry shares with the armed forces. The fact that Channel 4 introduced these advertising diversity awards just a few years ago, shows that there is a real appetite for content that is reflective of today’s consumer. It’s something that is often lacking in the home improvement industry, so it’s the perfect opportunity for the glazing industry to lead the way in promoting diversity in construction.